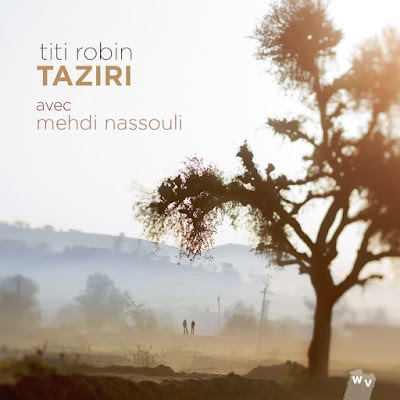 French guitarist Thierry “Titi” Robin is virtually unknown in the USA; hopefully this new album will go a little way toward righting that injustice. Robin has been developing his unique pan-Mediterranean style for more than 30 years; elements of Indo-Pakistani, Roma, Amazigh (Berber), Turkish and Western European musical culture all figure in his playing (on guitar and bouzouki) and composing. He’s an inveterate collaborator, and for this project he’s brought in young Moroccan singer-sintir (bass lute) player Mehdi Nassouli to augment his working trio of accordionist Francis Varis and percussionist Ze Luis Nascimento. The results are stunning: the album is beautiful, tuneful and especially soulful all the way through. Track 1, a Robin-Nassouli duet, sets the stage with its lovely melody and sympathetic duo improvisation. 2 and 8 (the latter is built on the same bass riff as 1) feature the full quartet. The tracks with an expanded band (featuring the Berber ribab fiddle and a trio of Flamenco dancer-percussionists) are even better: 7 has a Celtic feel and 4 is the same kind of tuneful gnawa music that Aziz Sahmaoui has been making lately. Superb.